The University of Toledo began in 1872 as a private arts and trades school offering subjects such as painting and architectural drawing. The idea behind the school was fostered by Jesup Wakeman Scott, a local newspaper editor, who published a pamphlet in 1868 entitled "Toledo: Future Great City of the World." Scott's publication expressed his belief that the center of world commerce was moving westward, and by 1900 would be located in Toledo. In preparation for the expected westward expansion of world commerce to Toledo, Scott donated 160 acres of land as an endowment for a university and the Toledo University of Arts and Trades was incorporated on October 12, 1872. The university's original mission was to "furnish artists and artisans with the best facilities for a high culture in their professions...." Scott died in 1874, a year before the university opened in an old church building downtown Toledo. By the late 1870s the school was in financial trouble and after thirty years in operation, the school closed in 1878. On January 8, 1884, the assets of the school became property of the city of Toledo. The school reopened as the under direction of the city as the Toledo Manual Training School. It offered a three-year program for students at least 13 years old who received both academic and manual instruction. University Hall was completed in 1931. By the 1920s, Toledo University was a growing institution, limited only by the buildings that housed it. Classes were held in two downtown buildings, but both were too small. In 1922, the university moved into an automobile mechanics training facility that had been constructed for World War I on the original Scott land after it outgrew the two downtown buildings where the university first operating in. Despite being twice the size of the old buildings, the location on the Scott land quickly became outdated after a 32 percent increase in enrollment created a shortage in classroom space. In 1928, Henry J. Doermann became president and soon initiated plans for a new campus. Doermann received his funding after a city-initiated bond levy passed by 10,000 votes. Doermann worked with a local architectural firm to design the new campus using design elements of the universities of Europe, the hope was that the architecture would inspire students. Less than a year later, University Hall and the Field House were completed in the Collegiate Gothic style. Although enrollments remained stable during the Great Depression, Philip C. Nash, who became president following Doermann's sudden death, instituted drastic measures to cut costs combined with New Deal funds from the federal government to help pay for new construction and scholarships. The impact of World War II drastically affected the university. The military contracted with university to offer war-training programs for both military and civilian persons. Areas of study for civilians included: Engineering, Science and Management War Training program classes, and Civilian Pilot Training classes. The military used the university to house, and train a detachment of the 27th Army Air Crew while the U.S. Cadet Nurse Corps trained nurses for army field hospitals. Enrollment of women grew during the war and many student organizations reflected the changes, intercollegiate basketball and football were suspended while the university's Red Cross chapter, the first of its kind at a university, sponsored knitting bees to make sweaters for soldiers. After the war, the GI Bill of Rights helped veterans pay for college tuition following the war and over 3,000 veterans took advantage of the program at UT. In 1945, the university purchased surplus military housing for the veterans and moved it to campus. The complex, known as "Nashville", transitioned into married student housing until 1974 after the peak of veterans decreased. In 1947, Wilbur W. White replaced Nash. White proposed a progressive ten-year development plan, but he died in 1950 before the new development was completed. The university, under new president Dr. Asa Knowles, continued White's plan and completed a new men's dormitory in 1952 and the new library in 1953. Educational programming for adult students was expanded and created the Greater Toledo Television Foundation to utilize television for educational purposes. In 1958, Knowles met with Toledo City Council to secure a new plan for the future financing of the university, during the 1940s the 12 percent of the city's budget was allocated to the university and this percentage proved unsustainable. Council suggested that the university acquire financial assistance from the state of Ohio to relieve the city's financial burden. Asa Knowles resigned the presidency that same year but William S. Carlson pursued the issue and three bills were introduced into the state legislature in 1959 to propose a student subsidy for the states three largest municipal universities, University of Toledo, along with the University of Akron and University of Cincinnati. The bills stalled but a $2 million levy was passed that same year to help sustain the university. Ohio's three largest municipal universities continued to push for financial assistance from the state and finally succeeded on July 1, 1967. The decision made the university a state university, after operating as a municipal university for over 80 years. In addition to subsidy for students, state support provided capital improvement money for campus building construction, the university changed its name to the University of Toledo. The 1960s saw an increase of political and social activism on the UT campus. Like many universities, UT campus experienced frequent student protests. Students protested a variety of issues, ranging from a peaceful food riot in 1968 over the quality of food, to protests by students opposing the Vietnam War that lead to several arrests. In 1970, UT students remained peaceful following the Kent State shootings of protesters. UT experienced racial tension when a protest by African American students in May 1970 in response to Jackson State killings temporarily closed University Hall. Again, the UT protest ended peacefully when the university president met with the students. UT celebrated its centennial in 1972 with a year of celebrations. Also that year, President Carlson retired, and Glen R. Driscoll was selected as new university president and began further expansion of the university with the addition of the Center for Performing Arts and Savage Hall in 1976, the Center for Continuing Education in 1978, and Stranahan Hall in 1984. The university replacing parking lots and the aging army barracks with Centennial Mall, a nine-acre landscaped mall in the center of campus. Construction began in 1985 on SeaGate Center in downtown Toledo as part of downtown's revitalization efforts. McMaster Hall was completed in 1987 and plans for the Student Recreation Center were made in 1990. That same year, the Greek Village and the Larimer Athletic Complex was completed and the Glass Bowl underwent renovations. Horton International House was part of the building boom of the 1980s and 1990s. Frank E. Horton, former president of the University of Oklahoma, was selected thirteenth president in October 1988 and continued the growth of the university, fostered by the previous presidents. Horton began a large strategic planning effort and organized the growth of the university. To help achieve the plans, in 1993 the university launched a $40 million fund-raising campaign called UT40. During the mid-1990s, UT renovated commercial buildings at Dorr Street and Secor Road for classrooms. A new Academic Center and Residence Hall was built in 1992 to house the Honors Program. The Center for the Visual Arts at the Toledo Museum of Art was also finished that same year; followed by the International House Residence Hall and Nitschke Hall in 1995. And construction began in 1995 on a Pharmacy, Chemistry and Life Sciences complex on the main campus and a Lake Erie Research Center at Maumee Bay State Park. The 1990s also included significant growth in technology. The university joined OhioLINK, a statewide library network, in 1994. Computer labs and hook-ups in dorms and offices provided Internet access and the university established a homepage on the World Wide Web. After a protracted protest by students, staff, faculty and community members, the board of trustees of the university agreed to include domestic partner benefits in the health care portion of the contract for faculty and staff with an effective start date of April 1, 2006. This development made the University of Toledo the first state university to begin covering domestic partners after the passage of Ohio Issue 1, several others had partner benefits before and continued them after the ban. The protest gained momentum after November 2004, when issue 1 was voted into law as an Ohio Constitutional amendment but began over a decade earlier with the work of several faculty members. On March 31, 2006, Governor Bob Taft signed House Bill 478, which merged the University of Toledo with the Medical University of Ohio. The merger became effective on July 1, 2006. The institution retained the University of Toledo name, and the former Medical University of Ohio facilities are referred to as the Health Science Campus. Toledo became the third largest public university in Ohio in terms of its operating budget, as well as one of only 17 public universities in the country that has colleges of business, education, engineering, law, medicine and pharmacy. As a result of this merger, the College of Pharmacy will be one of only 45 American Colleges of Pharmacy located in an academic health science center. The college's "Future of Pharmacy" campaign (2008–2010) was initiated to raise scholarship and equipment funds for the college's expansion into a new building on the health science campus, an expansion that will increase educational and research opportunities for students and faculty. What used to be called the College of Arts and Sciences was divided into three colleges, including the College of Languages, Literature and Social Sciences, the College of Communications and the Arts, and the College of Natural Sciences and Mathematics. Toledo is a public university and is governed by a board of trustees, and the Ohio Board of Regents, both appointed by the Governor of Ohio. The board is composed of 14 members, and is currently chaired by Joseph H. Zerbey, IV. The board members, which are unpaid community members, delegates its executive power to the president. The current president is Sharon Gaber. University Hall sits behind Centennial Mall in the foreground. The University of Toledo offers over 250 academic programs in a diverse and comprehensive range of studies. Although it is the sixth largest university in Ohio by enrollment, the university offers a 20:1 student-to-faculty ratio and a median class size of 25. National honor societies such as Phi Kappa Phi and Tau Beta Pi have chapters at UT. The university also offers several ways in which students can enrich their academic experience. These include the Honors College, study abroad, service learning, and undergraduate research. In 2006, The Princeton Review named the University of Toledo College of Engineering Graduate School as the #18 engineering graduate school in the United States. Additionally, the undergraduate engineering and business programs are consistently ranked by U.S. News & World Report, as are many other programs such as nursing, pharmacy, physician assistant, law, and education. The university has the University of Toledo Research Enterprise and a number of research centers and institutes. Located at Maumee Bay State Park, the Lake Erie Center supports interdisciplinary research involving environmental problems affecting the Great Lakes. The UT Polymer Institute, part of the College of Engineering, supports research in polymers and plastic technology. The Wright Center for Photovoltaics Innovation and Commercialization (PVIC) was created in January 2007 with an $18.6 million grant from the Ohio Department of Development and $30 million from federal agencies, universities and industrial partners to perform research involved establishing science and technology platforms, employing second and third generation photovoltaics (PV) materials, and devices tailored for applications in clean electricity generation. The three primary locations of the Wright Center for Photovoltaics Innovation and Commercialization (PVIC) include The University of Toledo, The Ohio State University, and Bowling Green State University. The center's research is focused on improving large area materials and devices, increasing the efficiency of solar technologies, and lowering production costs – with the ultimate goal of increasing the number of solar-powered electrical generation systems in homes, businesses, and utilities, as well as supporting the nation's defense and aerospace needs for advanced solar energy systems. 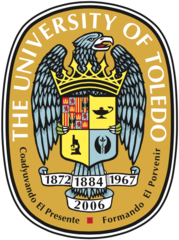 In 2012, the University of Toledo joined as partner members of the Discovery Channel Telescope. The University of Toledo's athletic teams play as the Rockets, and uniforms sport the colors midnight blue and gold. The university's sports teams play in the Mid-American Conference. The Rockets football team holds nine Mid-American Conference championships, in 1967 (co-champion with Ohio) 1969, 1970, 1971, 1981, 1984, 1990 (co-champs with Western Michigan), 1995, 2001, 2004, and 2017. Toledo Rockets football played in the 2010 Little Caesars Pizza Bowl on December 26, 2010 against Florida International. Toledo lost the game 34–32. Most recently Toledo Rockets football played in the 2015 Go Daddy Bowl against Arkansas State on Jan 5, 2015. The Rockets won 63–44. The UT rockets have the second longest winning streak in division 1-A football history (1969–1971) 35–0. In the season of 2009, the men's tennis team finished 2nd in regular season with a 17–10 record, and reached the finals of the MAC tournament for the first time in 35 years. In the Spring of 2011, the University of Toledo women's basketball team won the WNIT, becoming the first MAC team in any sport to win a National Championship in modern times. The women's cross country has won four MAC Championships (2001, 2002, 2010, 2011) and three MAC Runner-up finishes (2003, 2005, 2009). The women's cross country team finished 21st at the NCAA Championships in 2011 and 28th at the NCAA Championships in 2010. The women's track team also finished as the 2012 MAC Indoor and Outdoor Runner-up. The University of Toledo has two official mascots, Rocky the Rocket and Rocksy the Rockette. Rocky was introduced in 1966, and Rocksy was introduced in 2011. UT also has an official spirit crew known as Blue Crew. The University of Toledo Rocket Marching Band performs a pre-game show and halftime show at all home football games in the Glass Bowl. The University of Toledo also has a number of club sports under the direction of the university's Division of Student Affairs. Club sports receive funding from the university as student organizations, associated expenses in the sports are often supplemented by students' pay-to-play dues and fundraising activities. Club sports offered by UT include: bowling, women's basketball, crew, cross country, men's ice hockey, men's and women's lacrosse, quidditch, sailing, men's soccer, table tennis, tennis, track and field, men's and women's ultimate disc, fencing, women's volleyball, water polo, and wrestling. A few recent accomplishments of the University of Toledo Sport Clubs include: three straight individual wrestling national championships from 2006 to 2008; three Midwest-Collegiate Sailing Association Championships in 1950, 2008, and 2009; 2 Inter-Collegiate Sailing Association National Championship appearances in 2008 and 2009; a NIRSA Open Division Soccer National Championship in 1996; and an American Collegiate Hockey Association (ACHA) Division I National Championship in 1992. The Toledo Rockets men's ice hockey team is a member of the American Collegiate Hockey Association (ACHA) Division II. Besides belonging to the ACHA, the team is also an original member of a conference known as the Tri-State Collegiate Hockey League (TSCHL) which was established in 2010. The team plays a 30–35 game schedule against other club teams in the region. ^ The University of Toledo Logo Graphic Standards Manual (PDF). Retrieved 2016-03-29. ^ "Carnegie Classifications – University of Toledo". Carnegie Foundation for the Advancement of Teaching. Retrieved February 6, 2012. ^ Kern, Kevin F.; Wilson, Gregory S. (2013). Ohio: A History of the Buckeye State. John Wiley & Sons. ISBN 9781118548325. Retrieved September 14, 2015. ^ a b c d e f g h i j k l m n o p q r s t u v w x y z aa ab ac ad ae af ag ah ai aj ak al am an ao ap aq ar as at au av aw ax "The University of Toledo – History". University of Toledo. Archived from the original on 2005-04-03. Retrieved 2005-05-20. ^ a b c "History of the University of Toledo". University of Toledo. Retrieved February 6, 2012. ^ McManus, Tracey (January 5, 2012). "Most U.S. medical schools affliated [sic] with universities". Augusta Chronicle. Retrieved February 6, 2012. ^ Raghuveer, Amulya (September 11, 2009). "UT breaks ground on new health science facility". WNWO. Retrieved February 6, 2012. ^ Staff (April 21, 2009). "Aramark Higher Education raises 'green stakes' at UT". UT News. University of Toledo. Retrieved February 6, 2012. ^ "The Power Of the Sun". Newsweek Magazine. Oct 1, 2007. Retrieved February 6, 2012. ^ "Joseph H. Zerbey, IV (2018)". Utoledo.edu. Retrieved 2016-03-29. ^ "The University of Toledo – Dr. Lloyd A. Jacobs – 16th President of The University of Toledo". Utoledo.edu. Retrieved 2013-02-23. ^ Networks, Edumaritime. "Top Ohio Maritime, Logistics & Supply Chain Management Programs". www.edumaritime.com. Retrieved 15 March 2018. ^ a b "About". Wright Center for Photovoltaics Innovation and Commercialization. Retrieved February 6, 2012. ^ "Arizona partnership lets UT study the stars". Toledo Blade. 2012-07-23. Retrieved 2016-03-29. ^ "Toledo vs. Bowling Green – Game Summary – November 15, 2017 – ESPN". ESPN. Retrieved 2018-04-18. ^ "Rockets Ready to Defend Battle of I-75 Trophy". University of Toledo. Retrieved 2015-12-07. ^ "University of Toledo Sport Clubs". University of Toledo. Retrieved February 6, 2012. ^ "Tri State Collegiate Hockey League". Tschlhockey.com. Retrieved 2013-02-23. "The Princeton Review". The Princeton Review Top 20 Graduate Engineering Programs. Retrieved 2006-10-29. Wikimedia Commons has media related to University of Toledo.